ONLY IN LIELONGREN, 45 Day Refund, 18-Month Worry-Free Warranty. Professional After-Sales Team provides Free Life-time Technical Support. You Can Apply for Service Support with Your Order ID at Any Time. █ Stereo Sound Speaker. N12 Portable Mini Sound Bar is a 2.0 channel speaker equipped with two high-excursion drivers for full range audio, which deliver a noticeable stereo sound upgrade to your computer's weakened or faint internal speakers. █ One Cable for Both Audio & Power. N12 USB Powered Speaker only needs a single USB cable to plug into your computer to feed an electrical current and power the speaker while simultaneously working as the audio input and source of the speaker's sound. █ Two Installation Options. You can use the included clip-on mount to attach directly to any laptop screen that is ½ inch thick or less. And if you prefer a freestanding option to place next to your computer on a desk, use the included mount to prop the speaker up in a vertical position. █ Great Compatibility. 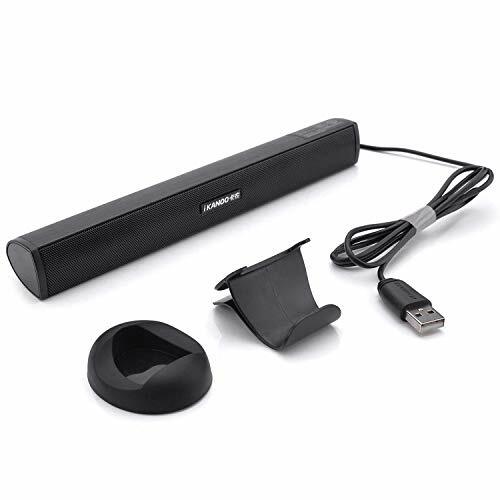 N12 USB Computer Speaker works great with all brands of Windows PCs, such as HP, Lenovo, ASUS, Dell, Acer, Chromebook or more. (Do not support Mac OS). █ Some Words From Seller. This USB Desk Standing Speaker is widely used in office and bedroom, it can save space of your desk and help averting messy cable, it's portable and light weight but delivering a noticeable stereo sound, while it would not be too loud to disturb your partners. If you have any questions about this product by LIELONGREN, contact us by completing and submitting the form below. If you are looking for a specif part number, please include it with your message.